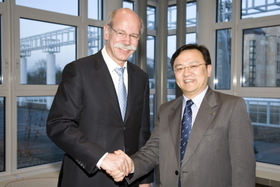 Daimler CEO Zetsche (left) and BYD boss Wang Chuanfu have a deal to make EVs together in China. BERLIN (Bloomberg) -- Daimler AG's CEO is counting on a new partnership to make the German automaker a leader in China's nascent electric vehicle market. “Our new joint venture is well positioned to make the most of the vast potential of electric mobility in China,” Daimler CEO Dieter Zetsche said in a statement Thursday. Daimler, the world's second-largest manufacturer of luxury cars, and BYD Co. Ltd., the Chinese automaker backed by billionaire Warren Buffett, completed their deal Thursday to set up a 50-50 joint venture to develop electric cars in China. Daimler and BYD plan to invest 600 million yuan ($88 million) in the venture. The companies originally announced plans to form the partnership on March 1. Daimler is pushing into electric-vehicle production as part of a challenge to BMW AG for leadership in the luxury segment. BMW will introduce an electric-powered city car by 2013 and is working with partner Brilliance China Automotive Holdings Ltd. on battery-powered models for the country, which became the world's biggest auto market last year. China's government may announce subsidies in 2010 to encourage the use of cleaner vehicles. The country is likely to account for at least 25 percent of global demand for battery-powered models in 2015, according to a forecast by J.D. Power & Associates. Part-owned by Buffett's U.S.-based Berkshire Hathaway Inc., BYD began mass production of the world's first plug-in, gasoline-electric hybrid vehicle in 2008. The manufacturer, which has its headquarters in the southern Chinese city of Shenzhen, signed an agreement with Volkswagen AG in 2009 to explore cooperation in areas including hybrid cars and lithium-battery electric models. 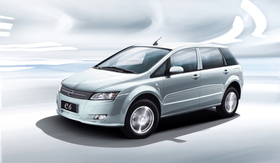 BYD plans to start selling the E6 electric car in the U.S. this year and in Europe next year. BYD plans to start selling the E6 electric car in the United States this year and in Europe next year. The company said on May 20 that it has an agreement to deliver at least 560 E6s to a taxi operator in Shenzhen in 2010, with 40 of the cars already in use as taxis in the city, as part of an effort to encourage individual purchases. Daimler's electric-vehicle strategy includes large-scale production of a battery-powered version of its Smart minicar starting in 2012. The company began assembling about 1,000 electric versions of the urban two-seat car in November 2009. Daimler also plans to build more than 500 electric-powered Mercedes-Benz A-class cars this year. The carmaker will make lithium-ion automotive power packs in a joint venture set up in late 2008 with Evonik Industries AG, Germany's largest specialty-chemicals maker. Daimler also holds a stake in Tesla Motors Inc., the California-based maker of electric sports cars and the battery supplier for the electric Smart.